26th of April 2011: AION has been released on FONIK WORKS. DVD. FONIK WORKS 2010. Duration 50 min. 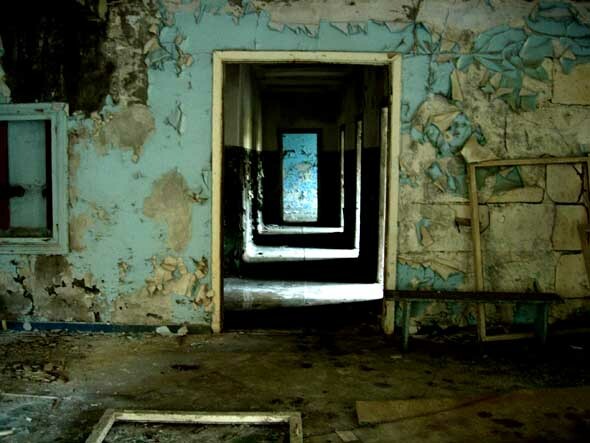 AION (Ancient Greek αιων = “infinity”, “eternity”, a time span beyond human understanding) is a portrait of four abandoned spaces inside the so-called “Zone of Alienation” in Chernobyl, Ukraine; a dripping swimming pool, a ruined concert hall, a mould-infested gymnasium and an old village church. During the days and weeks following the accident at the Chernobyl nuclear power plant on April 26th, 1986, the local population were evacuated by Soviet military, and they had to leave behind all their belongings. The former homes, meeting places and recreation centres were declared contaminated territory – in fact, they will remain uninhabitable for thousands of years. Two decades after the disaster, Jacob Kirkegaard visited the exclusion area with his recording equipment. His approach was inspired by Alvin Lucier's work “I am sitting in a room” . While sitting in a room, Lucier recorded his own voice reciting a text which he then played back in the room. He repeated this process over and over again until the different layers of his voice began to merge into a constant drone. Kirkegaard didn’t record his own voice but the voice of the room itself. He put up a microphone and a speaker, started the recording and left. After ten minutes, he returned, stopped the recording and played it back into the same space. With each new layer, the subtle sounds of the room were enlarged and deepened until they finally turned into one humming sound with many overtones. Thanks to Sarah Kirkegaard, Stine Hebert, Ania Pilarska, Touch, Anthony Moore, Siegfried Zielinski, David Larcher, Matthias Neuenhofer, “Verein der Freunde der Kunsthochschule für Medien Koeln” and the Academy of Media Arts Cologne, Germany.